This article by Michael Durrant, Lecturer in Early Modern Literature, School of English Literature, was originally published on The Conversation. Read the original article. In Mantel’s view, the past is not something we passively consume, either, but that which we actively “create” in each act of remembrance. That’s not to say, of course, that Mantel is arguing that there are no historical “facts” or that the past didn’t happen. Rather, she reminds us that the evidence we use to give narrative shape to the past is “always partial”, and often “incomplete”. “Facts are not truth”, Mantel argues, but “the record of what’s left on the record”. It is up to the living to interpret, or, indeed, misinterpret, those accounts. 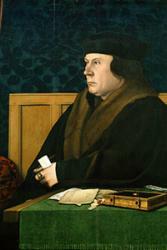 Brought to life: Thomas Cromwell. : Hans Holbein via the Frick Collection. (detail) via Wikimedia CommonsAnd indeed in Wolf Hall that blurred relationship between fact and fiction, history and myth, is often front and centre. In Wolf Hall the past is somewhere above, between, and below the official record. History is not to be found in “coronations, the conclaves of cardinals, the pomp and processions.” Instead it’s in “a woman’s sigh”, or the smell she “leaves on the air”, a “hand pulling close the bed curtain”; all those things that are crucially absent from the archive.